Queensland based Roamfree has placed itself into voluntary administration according to the goldcoast.com.au. This is confirmed by a filing with ASIC (Australian government body that regulates companies) sent to me by an industry insider. It lists Roamfree Ltd as "* UNDER EXTERNAL ADMINISTRATION and/or CONTROLLER APPOINTED **" dated 24 August 2009. "The group's subsidiary trading companies, BookEasy Pty Ltd, Roamfree Pacific and majority-owned Tourism Technology, are not affected." Toursim Technology operates the Calypso system used by many offline companies for inventory management. As of 930am this morning the main site is still live (screenshot below). I am always nervous about doing a Roamfree post. One back in April last year resulted in almost 100 comments, many of them unfit to print. That said I would welcome any info you might have as to which business are affected and which are not. Can anyone at RoamFree please confirm what level of support the booking engine will have moving forward? Will properties be paid promptly for bookings coming through? No, but if you want limit your risk, I would suggest SiteMinder's booking button as it is a way superior product anyway. I don't think anyone can guarantee payments coming form a company in administration, until the administrators have filed their report. Me thinks there is a lot of dirt still to be uncovered. From what i can tell its not Roamfree.com - money will be paid for bookings and all bookings are not affected..
@Anons - how about putting your name to the comments? The appointment of the administrators relates solely to the non-trading parent company Roamfree Ltd. 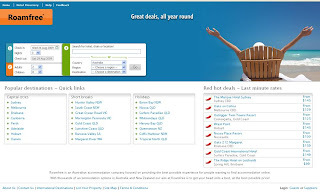 The Group’s subsidiary trading companies, BookEasy Pty. Ltd, Roamfree Pacific and majority owned Tourism Technology, will continue to trade as normal. Sounds like a weak spin, RoamFree. What are you planning to do to inspire confidence in the marketplace? Are there layoffs coming again and if so, in what departments? @Roamfree, which subsidiary does Roamfree.com fall under if the subsidiaries are "unaffected"? As one of the employees made redundant last year that still knows current staff, most of them have had it with the job insecurity and are looking for work elsewhere. Even if the main business will remain unaffected, there won't be enough staff soon to keep it running. wow - thats big news. dont want to jump the gun, but i guess there is a lesson that building a successful brand requires a lot more than mass advertising. "sounds very similar to roamfree who seem to have failed to build a brand despite mega bucks being thrown at it". quote"No, but if you want limit your risk, I would suggest SiteMinder's booking button as it is a way superior product anyway. I don't think anyone can guarantee payments coming form a company in administration, until the administrators have filed their report. Me thinks there is a lot of dirt still to be uncovered." Wow talk about kicking a company on the ground sounds like a dirty selling campaign udopted by siteminder months ago. All properties will still be paid from what i can gather and everything is operating as normal. Full support teams are still availbile and all bookings are processing. AS from the article all supsidary companys are still operating it is the group intity that owes money not individual companies. quote: "AS from the article all supsidary companys are still operating it is the group intity that owes money not individual companies." And where do you think the money will come from to pay off the parent company's debt? It will have to be paid by the Administrators calling in debts owed to the parent company by the subsidiaries, or by selling off part or all of the subsidiaries - so there is no way they won't be affected in some way. quote: "sounds like a dirty selling campaign udopted by siteminder months ago"
I'm lost here... are you saying Roamfree is in receivership because of a dirty Siteminder selling campaign which started months ago? If so that would be one hell of a selling campaign! This is not what the industry needs right now that's for sure. I wish them the best of luck in pulling through this crisis. Online travel is obviously extremely competitive and there are no shortage of options when it comes to booking accommodation. I personally believe that RF took the wrong approach in trying to compete head to head with the existing major brands (e.g. Wotif needitnow and HotelClub/Rates2Go) by chucking mega bucks into marketing, rather than clearly differentiating its offerings and marketing its unique points of difference. I believe they will pull through this hiccup however, and if it makes them focus on where they can add value then they will be stronger for it. Yet another blow to the staff that remain at Roamfree. Loyality hasnt paid off this time. The only negative thing that will ensure their fate right now, is if properties pulled out, id say everyone chill out until administration occurs. And @properties, if you're that worried, change your payment collection methods. I have it from a mate still in Roamfree that their head of sales resigned a few days ago and it looks like their new operations manager just left too. I heard from a mate that Roamfree has been sold - Can anyone confirm this? And I heard from a mate that RoamFree purchased Wotif, Webjet and Flight Centre and Tui...oh and Bing. Roamfree claims forward bookings are unaffected but we (a provider) will insist on having payments forwarded or else not honour bookings - as a consumer I would choose a different booking engine and not risk paying for accommodation I won't be receiving. and we heard the Tony Smith is really Superman. My Concern is, if roamfree.com is not affected and business will remain as per usual, then why is this months payments to affiliates not happened? Already a week late. I'm assuming all the bank accounts have been frozen. Its hard to keep faith and believe RoamFree when they say it "will not affect affiliates" when it already has. as an accommodation provider we use ezyrez online as opposed to the roamfree solution for online bookings from our website. it is free and does not cost us a dime as we use ezyrez hotel software. however it is not channel management software, to get the full product you have to pay. I hear the Roamfree business has been sold to a former management employee. Obvious to us left here who that is seeing as he is here everyday. I have heard they have started cutting jobs again too. Yes, jobs have been cut. Barely anyone left now. Also, yes, a previous exec now controls it all. The People who were cut on Wednesday still have not been paid their redunadancy pay..... not sure i would trust them. As an Affiliate Marketer for the past 12 years I can only say that I have been paid all of my commission up until the end of August and my understanding is that so have all of the other Affiliates. Wow for all of the people that left this week you must have known it was coming I left 9 months and have never looked back I have a a great motto that I live by. "Build a Bridge and get over it"
I hope we get our entitlements before investors get their money.. Yes, Mr Oliver purchased the business. I left Roamfree a few months back and it is good news to hear that it will continue to trade. I hope the new owners will be able to get back some of the talented staff that have left recently to keep it going. Being a previous employee,I am glad that someone purchased the business as a going concern as we all put in alot of work over the last couple of years and I'm sure it will be a success in the future. People need to learn to take the good with the bad and move on to new opportunites. All the best Roamfree. Certain ex-staff may be happy as they suddenly resigned and left to get their entitlements before anyone else. "Can anyone confirm that David Oliver is now the new owner"
I've heard from a reliable source that the administrators settled the sale of the entire business last week and the new owners are the Frawley family. David Oliver is only the face of the company. The Frawley family don't want it to be known that they are now the owners and the purchase of the business was completed without other interested parties being given any opportunity to be involved in the sale process. The company will continue to operate from the present location. Dear Anon, I can only assume that you are either a competitor of Roamfree or a very underhanded person. My understanding is that the businesses were advertised for sale in the papers and that numerous inquiries were fielded by the administrator. Have the guts to put your name to the blog. Agreed with Eventures. The sale was advertised in the papers. Enough with the negativity. Good luck to new owner. I heard the same info from a contact of mine. It was a one horse race and the administrators were always going to strike a deal with the Frawleys. To all you doubters: WAIT AND SEE...THIS INFO IS 100% RELIABLE! I agree with Max if you aren't going to be upfront and stand by your comments don't say it, otherwise we can only assume that you are doing it to be destructive for all concerned. The moderator of this blog really needs to turn off Anonymous as a lot of the Anonymous seem to be for mischievous purposes only. Tim?? @Stuart and @Max - I agree that people should put their names behind posts. I have been deleting comments that insult individuals but for now will let the others ride. Sorry, haven't had a chance to check The Boot since my 1.22pm post earlier today. What is everybody so upset about? I'm not a competitor of Roamfree or a disgruntled ex-employee or underhanded or mischievous or destructive, hell, I don't even work in the same bloody industry. Somebody asked whether David Oliver was the new owner of Roamfree and I posted the facts. No, he isn't the owner, the company is now owned by the Frawley family. Don't shoot me I'm only the messenger. Well if your "I'm not a competitor of Roamfree or a disgruntled ex-employee or underhanded or mischievous or destructive, hell, I don't even work in the same bloody industry." then why hide behind an Anonymous post? If it was all above board, I'm sure the new owners would have been announced to the market by now. This is not a place for personal grievances, criticising individuals or making accusations of corruptions, laziness etc - especially anonymously. It is place for industry analysis and information. If you would like to set up a forum or notice board under your name then I will link to it. Well said Tim, this blog has definitely been used as a Tool for venting some anger and frustration it should always be as an Industry Tool. Thats what blogging is for 'Stuart'. If you can't deal with opinion you should probably stick to newspapers. You are wasting blog space here by making blogging the subject of the blog instead of Roamfree. Please stay off the blog unless you can contribute to the topic. Uuuum, David, that would be your new company 'Tourism Holdings' not 'Travel Holdings'. Might want to make sure that one is right on your business cards. Whoops sorry about that Tourism Holdings Pty Ltd today settled the acquisition of Resonline, Roamfree advanced, roamfree.com and BookEasy. The company and its subsidiaries are 100% owned by myself and went through a negotiation process with the Administrators as did other interested parties. We are now looking forward to getting on with business. David,I wish you all the best in your new venture, you have certainly come a long way in such a short time from your days as a salesman for Resonline. It is remarkable achievements like yours that makes Australia the great land of opportunity. With a strong management team to assist you, I am sure you will be successful. Best of luck! Who will be responsible for the day to day decision making in the company? I heard from a Frawley family member that they now own the company. I doubt whether this particular family member would be telling me lies. If so, it's the first time that this person would have lied to me because he, and his family are, in general, sincere people and very honest in their business dealings. I don't know whether you are the real "David Oliver", is it possible for Tim to confirm this poster's identity? Happy for anyone to email or ph me at Roamfree to discuss their concerns. @Anon 23 Sept 10:32 am - you are not right. This is not A blog, this is MY blog. It has my name on it. I am responsible for all the content on it. It is not a open room where anyone can shout whatever they like with no consequences. If you want a place where you are free to say whatever you want then please feel free to use one of the 1000 free forum or blogging tools to set up your own. To all Anon commentators please stay off the blog unless you have some analysis, insight or news to contribute you. That means keep your insults to yourself. @David - thank you for joining the conversation. Please feel free to email me at timsboot [at] gmail [dot] com if you would like to organise an interview and so I can confirm your identity. @ All - I am going to delete the exchange between David and Anon(s) about the involvement of others in his ownership because I don't like people using MY blog to accuse others of being liars. If you want to ask questions of other commentators find a way to do it without accusing any one of dishonesty or other character flaws. I cannot allow that style of material on a blog with my name behind it (of course you could set up your own). So is the David the sole director/shareholder of Tourism Holdings Pty ltd? Does anyone know what happens to the share options that were given out to all staff? Roamfree is no longer under Administration and all products will continue to be supported except for Horizon. All bookings are secured in a trust fund and will be paid out to accommodation suppliers as normal. Is there any reason why you are no longer supporting Horizon, where can we go to for future support of this solution if we need it? Maria, why don't you ring Mark Frawley at Roamfree, he's making all the decisions now and should be able to give you an answer. I thought David Oliver was the new owner? What has Mark Frawley got to do with it? Maria, unfortunately you and others have been misled about the new ownership of Roamfree. If you truely belive that David Oliver is the new owner of Roamfree, not the Frawleys, then the poster on this forum purporting to be David Oliver has invited those with concerns to contact him. I would love for you to do just that and post his replies back here. I did my own research based on his newspaper article of last week. The company he has created to purchase Roamfree through is 100% owned by another company, of which he is the sole director, secretary and shareholder. There is only one share and he owns it. Therefore unless he sells this company to someone else, it looks like he is the new owner despite what others are saying. Why would he want to pretend otherwise? I'm just curious why RF convinced people to move from RoamFree Advanced, Resonline and Last Minute Manager to Horizon as it was a better product, but now they're trying to convince people to go back. I just wondered why they don't support their Horizon solution anymore. Or is this still owned buy the original RoamFree owners. Anyone know the answer? Hi maria, tha answer is simply that roamfree didn't own the horizon product and it was developed by an English company paid by hirum, and hirum didn't have the support and infrastructure to distribute it so they paid roamfree to sell it. Unfortunately you've been misled. If this were the case then it would make sense to keep earning this income, after all, you don't buy a company and then give away some of the income that makes up the value of the company. I have tracked down the developers of this product who advise that RoamFree were licencing the product from them as they realised their own product was being left behind by products such as Siteminder, HiSite etc and they didn't have the money or the skill set to on develop it. RoamFree marketed Horizon under a licence agreement and were supposed to pay a royalty to the development company. Roamfree didn't cough up the money and the licence was revoked 2 September 2009 due to many breaches. Apparently there was a grace period of 12 months to allow Roamfree to migrate their users over to an alternate solution, I'm not sure why they didn't take up this offer.I personally believe this is the truth and apparently the developers are willing to allow anyone unsure about the facts, the opportunity to view the contracts. It's a shame you've been told untruths but I'm sure it doesn't surprise many of us. In the meantime, I now have what i hoped to gain from posting this blog, the same product,from a strong company, with access to support if need be under the HiSite brand. So it's over and out from me! wow maria, you sure seem to know an awful lot about some very low level contractual details like exact dates of contract breach regarding horizons and roamfree etc. You wouldn't possibly be using this blog as a shameless plug for horizons, would you? I'm guessing that you are somehow affiliated to Hirum as your post here reads like an advert. Not at all, as I said, I tracked down the developers through a neighbouring property who provided me with the details to ensure the facts were known. I can post their details here if you would like to contact them too. As for an ad, Horizon was the name branded by Roamfree, if they don't sell this anymore, what would be the point of me trying to advertise it! How come you post anonymous? Are you from RF perhaps and don't like the truth being known. Anyway, got a business to run, middle of school holidays and we are fully booked thanks to our great Channel Manager! I am very tempted to kill all comments on this post. Please keep your comments to industry analysis. Tim, I was wondering whether David Oliver has been in contact with you to clarify some of the matters raised by posters on your blog? I heard that the CFO of Roamfree has also left the business. If that is true it will be a big loss to them. Is Roamfree still offering its affiliate program? Are affiliates still getting paid? I've been with RoamFree for a number of years and they've never missed a payment. Unfortunately, an ineffective sales team in NSW has seen property numbers in regional areas such as the Hunter Valley, Central Coast and Port Stephens decline. It's about time they rewarded affiliates for signing up new properties. Hi Troy, happy to discuss I will drop you an email.